Join the remarkable Earth-Watchers once again as their nature-saving odyssey continues! Two courageous & original members of the Earth-Watchers: Warrick & Micah must travel to a faraway land near the Himalayas known as: Tibet- to aid their fellow Earth-Watcher, & friend Dr. Jonathan Brandywine- or better known as: Long John. Long John is a scientist & an environmentalist, who spent five years living in the Himalayan Mountains, to help & study the elusive, endangered, yet, beautiful snow leopard. However, this journey will not be a vacation or a tourism trip for Warrick & Micah, it will be a perilous mission, they were called to assist Long John in the fight against vicious & dangerous poachers, who were hunting snow leopards for their fur. The wealthy & ruthless Lady Nadia, has an insatiable hunger for snow leopard fur, the fur was not only gorgeous to Lady Nadia, but it was also very lucrative in the underground & criminal exotic animals fur trade. Daily Long John had to witness the ugly carnage of poachers hunting the rare snow cat, sadly, one day he witnessed a mother snow leopard shot & killed while her cubs watched in fear. Long John had no choice but to raise one of the cubs, & he made a remarkable discovery! 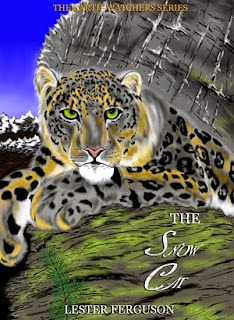 The snow leopard was a highly intelligent & skillful cat. When Warrick & Micah finally arrived in Tibet, they didn't meet a friendly welcome party, Lady Nadia's corrupt police just had a suspicious feeling the two foreigners were not innocent tourist, and they needed to be watched closely. Lady Nadia's corrupt police goons were right! Warrick & Micah were Earth-Watchers & they bravely came to put an end to Lady Nadia's darkness! But to the Earth-Watchers surprise, when the scene turns darker & hope fails, the snow leopard whom they came to help, will be their guiding light..